Cassim: You killed Sa'luk. The Code of the Forty Thieves is very clear on this point. You're in! Genie: [after elephants run over the Magic Carpet] Oh, they trampled the carpet! That's a little redundant. So this isn't a bad day for you really, is it? Genie: Al, you're back! And your front! You're both here! Genie: Oh, no. The crowd is parting. Who's coming? It's Moses! Iago: Does this code have any rules that don't end in death? Cassim: It's a strict code. Iago: [with his tail stuck in the door] How bad is it? Merchant: [singing] So it goes, short and sweet / they were wed down the street / may their marriage be truly blessed / Happy end to the tale and tomorrow's a sale / So I'd better go home and rest / Here's a kiss and a hug / sure you don't need a rug? / I assure you, the price is right / Well, salaam, worthy friend / come back soon, that's the end / 'Til another Arabian Night! Genie: [singing] They're finally getting married! Sultan: [singing] They're finally getting married! Thieves: [singing] They're finally getting married! Iago: [singing] Look at all these presents! Jasmine: [singing] We're finally getting married! Abu: [squeaking] You're finally getting married! Aladdin: [singing] I'm finally getting married! Genie: [Genie's pointing an elephant towards some thieves] Don't make me use the other end! Magic Oracle: I see all that has been, and all that will be. Thief: [singing] Are you out or in? Smaller Thief: [singing] Make your choice now / Sink or swim? Genie: [as Mrs. Doubtfire] Listen to Genie, dear. Genie knows. You've got to get your mind off this incessant waiting. Genie: [multiple Genies are pointing their guns at Cassim] Do not attempt to move or we'll be shooting ourselves. Sa'luk: [after seeing that Cassim is not in prison with the other thieves] He's not in there! You didn't capture the King of Thieves? Razoul: Because he was not at the hideout! Sa'luk: He had to be there. Where else would he be? Guard: [entering cautiously] Apologies, Captain Razoul. Guard: Well, the Sultan said he won't be able to sentence your prisoners until tomorrow. Razoul: What's more important than sentencing my prisoners? Guard: Why, the wedding. Jasmine and Aladdin are finally getting married. Sa'luk: Aladdin! You didn't capture Aladdin with the others? Razoul: Why would he be with the forty thieves? Sa'luk: Because his father is The King of Thieves! Iago: [while the thieves pamper him; miserably] Oh, I love you guys. Magic Oracle: The Vanishing Isle will appear at dawn. I'll show you the way. Sultan: [to Aladdin] Don't look so solemn, boy. This is a happy day. Genie: [seeing the wedding guests assembled for the wedding] They're here. Genie: I'm late, I'm late, for a very important date. Iago: [after his tail gets stuck in the stone doorway in the cave; he is left with his tail bone; sarcastically] Oh, this is attractive! Razoul: Our princess is to wed.
Genie: [as a beggar] Oh, wonderful! Genie: Oh look! There's Osiris. Oh, Osiris! Osiris, could we have a word with you? Cassim: [after the stampede of elephants and thieves leave] I'll see you again, boy. Cassim: [pressing Aladdin to the floor] You don't stand a chance against the King of Thieves! Aladdin: [grunting] When I get up, I'll bow to you! Aladdin: [after knocking Cassim to the floor] Could I see your invitation? Genie: If you're Al's dad, and the King of Thieves, I just wanna know one thing. Genie: Will you be having the chicken or the sea bass? Magic Oracle: Have you chosen your question? Aladdin: Where is my father? Magic Oracle: [points off into the distance] Follow the trail of the Forty Thieves. Your father is trapped within their world. 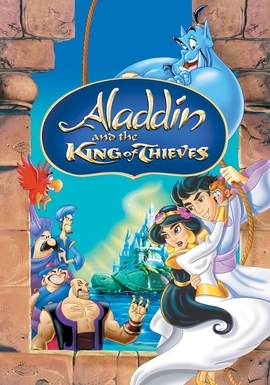 Aladdin: Forty Thieves? Is he hurt? how long has he been their prisoner? Magic Oracle: [vanishing] I'm sorry, I can only answer one question. Aladdin: [singing] There's a party here in Agrabah, and the party's all for me. / Just look, you guys, at where we are, and how our dreams have come to be. Jasmine: [singing] There's a party here in Agrabah, and I can't believe it's true. / After all this waiting, here we are. We'll finally get to say, "I do". Aladdin: I never ever had a real family. Jasmine: I never ever had a real true friend. Aladdin, Jasmine: Someone who could just understand me. Genie: [the wedding pavilion starts shaking] I thought the earth wasn't supposed to move until the honeymoon. Genie: [crying at the wedding] It's all so magical. I'm not gonna cry. I'm not. RoboGenie: You have violated the perimeter of the Aladdin and Jasmine Wedding. RoboGenie: Prepare to be vaporized. Thank You! Genie: I'd like to see one of those Forty Thieves get within an inch of your wedding. Cassim: Now get off that thing before you break your neck. Genie: Uh-Oh. Uh-Oh. Definitely an oracle-tells the future. Uh-Oh. Iago: You're a good guy, Cassim. But not too good. Genie: Geronimo! Arapaho! Navajo! Pocahontas. Genie: And your name is? Thor: [with a lisp] I'm Thor. Thor: [with a lisp] Well it hurth. Magic Oracle: I am bound by the rule of one: one question, one answer. Iago: I only want one answer! Where is the ultimate treasure? Magic Oracle: You've already asked your question. Genie: Whoa. I was having an out of movie experience. Jasmine: [after knocking out one of the thieves] That was for ruining my wedding. Genie: Oh, look, it's a Kodiak moment! Genie: Put that bear out of here. Genie: [as Forrest Gump] Mama always said, "Magic is as magic does". Genie: [singing] There's a party here in Agrabah / Guests are filling up the room / But there's something missing. Yes, uh huh! Sultan: Where is the groom? Genie: Maybe you could elope. No, you can't elope. But, oh, honey dew! Genie: Back off, Al, this creep's got a yellow sheet as long as my arm. Aladdin: Genie meet my dad. Genie: [confused and defeated] Stand down men. Smoke 'em if you got 'em. Iago: Allow me to introduce. Cassim: The King of Thieves. Genie: All units, we have a Code Red. Genie: Once again, this whole broadcast has been brought to you by Sand. It's everywhere, get used to it. Iago: Meet your match, Zorro! Cassim: Good birdie. Polly want a little? Iago: Say "cracker" and I let you have it on principle! Genie: [as Bing Crosby] I'm sure Ali Baba and the boy are on the road to Agrabah right now. Isn't that right, Bob? Genie: [as Bob Hope] That's right, Bing. How 'bout this town? Is it wild or what? It's like one giant sand trap, and me without my wedgie. Hey, let's give a big hand for Brooke Shields.